Thirteen years ago, Popsie Chadwick fell in love with a house in Acton. The only thing which made it slightly less than desirable was what she describes as a “muck heap across the road”. This so-called muck-heap was a house originally (so legend relates) inhabited by a woman whose only son became a prisoner of war in Burma. It was lived in as a squat, then vandalised and eventually burnt down. It then fell into the hands of Ealing Council “possibly by default”. The Council paved it and planted a few pyracanthas and a few other shrubs. The result of this half-hearted attempt at a garden was that the neighbourhood used it as a communal fly-tip and threw in rubbish, mattresses and fridges. Homeless people used it as a loo. Popsie and a group of neighbours decided to take matters into their own hands. The rubbish was taken away. “We got packets of seeds, cheap plants and poked about.” Various people had gardened in the space before, but none of their attempts had been successful. Steve Keys, who has now moved to Hanwell, says: "Before I got involved with the garden, my experience of dealing with the Council was mainly negative but this was a very positive experience - all the people I met, especially in the summer, made me realize what a great thing this garden was for the community." Lots of people rallied round and helped, including Vicki Barker who now runs the APPLE art block in Acton Park. Others were “sniffy” and said the project would never work. “However, Rachel Ragman, who then lived in Myrtle Road, introduced us to Action Acton and was a great help as she pleaded for our cause. They in their turn helped us to get grants from the Millennium funds and so on. “Everybody in the area wanted a garden. 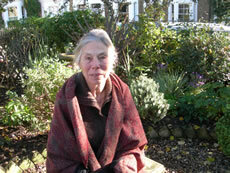 We eventually formed a committee of fifteen people - some of them very energetic – including Branwen Jeffries, Mary Stewart, Flora McDonald, Sue Madden, Hermione Sacks, Cindy Greener and Lilly Gupta. In 2000, grants started coming through for the garden but work didn’t start on the landscaping until 2001. “It cost £6,000 to clear and level the site, to put all the brickwork in and make a fence and gates.” The shape was designed by Grace Ingalby. "We raise funds at wonderful summer garden parties and Christmas parties both organised by Susan Madden. These have been going on for five years and are well-attended by around 100 people. It’s a wonderful opportunity for everyone to get together. There is fantastic food – especially at the Christmas party. “I believe the garden has brought the community together in a really nice way.” Residents who participate live in Shakespeare, Myrtle, Woodhurst, Spencer and Chaucer Roads. “We used to have grants, but they do insist on us spending them immediately which I am reluctant to do. I think it’s important to have a safety net as otherwise it’s bad housekeeping. So we decided to raise our funding independently. “There’s plenty of work to be done in the garden: It needs pruning back thoroughly, bulbs need to be planted and netted to stop squirrels, leaves need to be cleared up, it also needs a good weed with a hoe and on hands and knees. Some of the plants have outgrown their spaces and need to be cleaned out to let the other plants flourish. The garden is certainly something to be proud of. 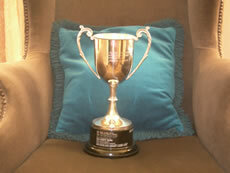 Since it was created, it has been awarded first prize in the neighbourhood awards category by Ealing in Bloom. 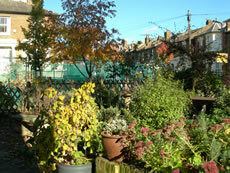 It was also awarded Third prize for a Community Garden in the London in Bloom competition in 2006. She and her band of co-gardeners - have certainly done their bit to improve their neighbourhood and to transform a "muck heap across the road" into a delightful oasis.